Though Yiannopoulos’s hateful antics got him kicked off Twitter, the book publishing industry seems to view his polemical routine as a good bet. Or, at least a good enough bet: Threshold advanced him $250,000 on the book, a sum higher than the average advanced to a first time nonfiction writer, but lower than most of his counterparts. Former Minnesota Governor and failed presidential candidate Tim Pawlenty, for example, received a $340,000 advance for his 2010 dud Courage to Stand. “That he would parlay his notoriety into some sort of book deal is an unsavory, if inevitable, prospect,” Alexandra Schwartz wrote at the New Yorker. Some were surprised that Simon & Schuster, an ostensibly respectable publisher, would stoop low enough to offer Yiannopoulos, with his history of harassment, a platform to explore ideas now unwelcome on platforms like Twitter. But given the history of the conservative book publishing industry, it’s hardly surprising that they would welcome Yiannopoulos into the fold. Yiannopoulos is both the offspring and natural heir of the conservative publishing industry, a market that’s always valued angry bombast over substance. [...] He doesn’t have a book deal with Simon & Schuster, the prestigious imprint that publishes people like Bret Easton Ellis, Dave Eggers, and Hillary Clinton. He has a book deal with Simon & Schuster, the publishing house that includes such imprints as Enliven (New Age books) and Jeter Publishing, the official publishing imprint of New York Yankee Derek Jeter. Simon & Schuster’s statement was mired in a particular kind of unabashed irony: have an open mind and buy the book, the publisher encouraged, as though taking a page from Yiannopoulus’s own absurdly wrong interpretation of liberal tolerance (a favorite phrase of Yiannopoulus and his ilk who use the phrase as a bludgeon with little concern over its purpose or empathetic values). The almost ridiculous suggestion that readers “withhold judgment” on a book penned by someone with Yiannopolous’s reputation aside, “buy the book” is the most important takeaway. A controversial book is, after all, good for business. After the announcement, Yiannopolous’s book shot up to the top place on Amazon’s best-seller list. Even a week later, the rough life cycle of a social media controversy, his book sits at number 29, wedged between the Dalai Lama and Paul Kalanithi’s universally praised memoir, When Breathe Becomes Air. 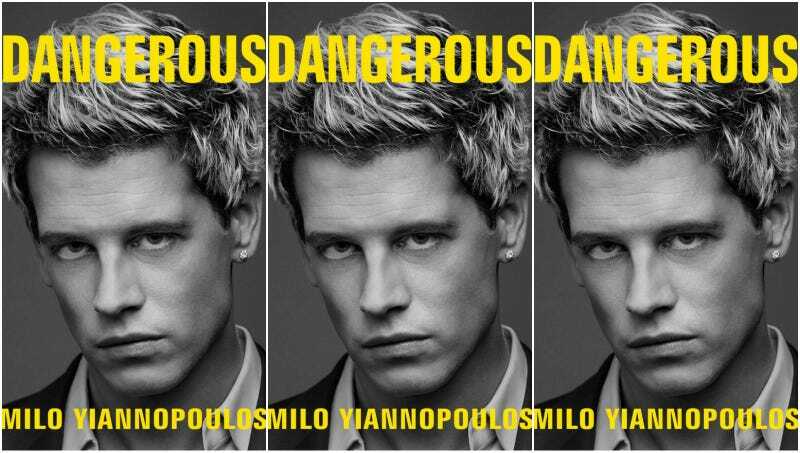 Threshold’s decision to publish Yiannopoulus might have come as surprise, disconcerting perhaps because—as my colleague Ellie pointed out—Yiannopoulus’s shift from the fringe to the mainstream reflects a larger corrosion to the public sphere of ideas in which the loudest jerk is the most important. But, if anything, Yiannopoulus’s hackneyed brand of provocation is the natural outcome of the conservative book publishing market where, increasingly, simply being outrageous is somehow synonymous with being interesting or intellectual. The conservative book publishing industry has already published books that compare liberals with fascists, employ highly questionable racial science, and books that claim to connect the dots between President Obama and everything from black liberation theology (depicted as conspiratorially criminal) and radical socialism. The inclusion of conservative imprints at the Big Five publishing houses is a relatively new relationship. Before 2003, nearly all conservative books were the products of the Washington D.C.-based publisher Regnery or the Free Press. Throughout the 1990s, Free Press published two of the right’s most memorable books: Dinesh D’Souza’s Illiberal Education and Charles Murray and Richard Herrnstein’s infamous The Bell Curve. Meanwhile, Regnery was churning out conservative bestsellers, most of which were polemics about the Clintons, then occupying the White House. An upbeat profile of the conservative book industry published by the Manhattan Institute’s sympathetic quarterly City Journal notes that while Regnery was quickly publishing right-leaning bestselling books, including some of Ann Coulter’s earliest books, the larger industry regarded their success as a blip, little more than the temporary result of the Clinton conspiracies relished by a larger portion of America. “But even after the Clintons departed Pennsylvania Avenue, Regnery’s conservative hits kept coming,” City Journal reports. During the decade, mainstream publishers had a handful of conservative hits, including Rush Limbaugh’s The Way Things Ought to Be, published by Pocket Books, another Simon & Schuster imprint, in 1992. But, for the most part, conservative polemics were relegated to fringe publishers like Regnery and Free Press’s idiosyncratic ideologies. Their success was hard to deny—both publishers recognized a niche market and produced books, no matter how questionable their content, that catered to particular conservative readers, largely middle-aged white men. That success piqued the interest of the Big Five who, eager to grab some of the profits, began launching their own conservative imprints in the early 2000s. Threshold Editions, Simon & Schuster’s attempt to get in on this easy money, was launched in 2005. Along with Crown Forum, Threshold, founded by conservative talking head Mary Matalin, is one of the most profitable conservative imprints. In 2009, when Simon & Schuster saw its sales drop significantly, Threshold was one of the company’s reliably profitable imprints. It currently counts 51 New York Times bestsellers among its publications. When it signed Yiannopoulos, Threshold added him to a roster that already includes some of the most recognizable names in the conservative yelling industry, including Glenn Beck, Laura Ingraham, and Michelle Malkin. The imprint also published Donald Trump’s Great Again in 2016. Threshold’s mission statement makes no bones about its purpose; it touts itself as a “forum...for innovative ideas of contemporary conservatism.” But a quick look at the books they’ve published—the imprint is intricately tied to the rise of Glenn Beck—reveals less of an interest in “innovative ideas” and more in sheer marketability. Nearly all of the writers published by Threshold have (or had) their fingers in major media markets, or at least access to conservative media like Fox News or talk radio. That’s part and parcel of the industry. [...] Face unprecedented pressure to land cable news and radio provocateurs like Ann Coulter, rather than promote the combative intellectuals, like Allan Bloom and Charles Murray, on whom the business was first built. That pressure is usually framed as a mournful degeneration of the once proud tradition of conservative publishing, the exchange of loud talkers with serious conservative thinkers. It works only if one considers Charles Murray, who succeeded in putting a new costume on old Galtonian eugenics, considerably different from Yiannopoulos. The two share a genealogy, Yiannopoulos just doesn’t bother with the veneer of academic racism. Yet, the narrative thread BuzzFeed presented—that pushing conservative writers into niche imprints is both killing and radicalizing the industry—is a story that’s been written multiple times since the Big Five launched their imprints. Rather, the conservative imprints have always relied on books by loud trollish writers like Yiannopolous’s; it’s effectively the bedrock of their industry. With the exception of a handful of books, usually memoirs by Republican presidential candidates, it relies on publishing multiple books by familiar names, fame usually garnered through television, talk radio, and major web platforms, like The Blaze or Breitbart. There isn’t much daylight between Rush Limbaugh’s angry monologues on “feminazis” and Yiannopolous’s thoughts on feminism. What has changed, however, is how increasingly extreme the actions of a so-called “provocateur” need to be in order to garner outrage. Yiannopolous has embraced that extremism with unrepentant glee. He has succeeded in, what Penny described as, “the game of turning raw rage into political currency, the unscrupulous whorebaggery of the troll gone pro.” And the conservative book industry has rewarded him, just at it rewarded his forebearers.